U.S. stocks have endured some "interesting" trading over the last couple of quarters. The broad market sold off hard in the final three months of 2018, only to rally just about as hard in the first three months of 2019. But not all asset classes have had such an abrupt regime change. While the S&P 500 zig-zagged hard during the past two quarters, ending up about 0.72% lower than it started Q3 2018 on a price basis, gold has been a stable outperformer over that stretch, climbing almost 8.5% higher. It's one thing to see outperformance in gold, but it's very much another for that outperformance to be "predictable." And for gold, it has been. From a technical standpoint, gold's bullish reversal that kicked off at the end of September has been more or less textbook. So has the best way to play it. 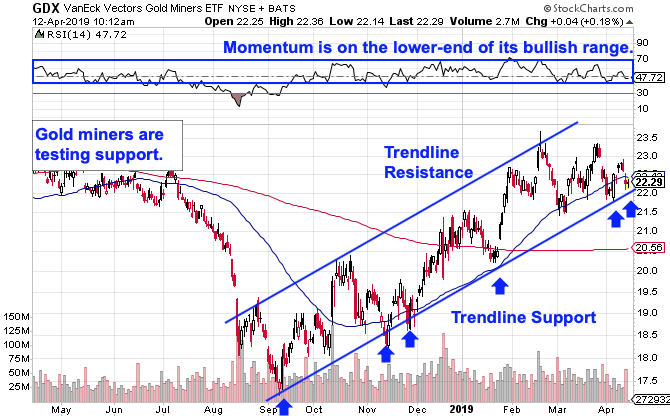 All told, the popular VanEck Vectors Gold Miners ETF (GDX - Get Report) is up almost 22% since we first looked at the bullish reversal pattern setting up in shares. Now, with metals vastly outperforming the stock market in the last half-year, the question is whether gold is still glittering in 2019. To answer that, we're turning to the chart for a technical look. Technically speaking, there's still a lot to like about GDX even though this ETF has basically traded sideways since the final week of January. Shares have been trading in an extremely well-defined price channel since the middle of September, catching a bid on every successive test of the bottom of its trading range. Now, the next bounce looks like an opportunity to be a buyer before the next push to the top of the channel. Momentum, measured by 14-day RSI up at the top of the chart, adds some extra confidence to the upside move. While GDX's momentum has cooled since January, it remains on the lower-end of its bullish range, leaving room for it to heat up from here. There's a compelling case for why gold miners should fare better than gold itself as prices expand. After a swift move higher, gold, measured by the ever-popular SPDR Gold Trust (GLD - Get Report) , has been making lower highs. Support at $121 for GLD looks like the do-not-cross line. If GLD fails to hold support at that level, shares open up potentially substantial downside risk. That wouldn't bode well for the GDX trade, but it's important to recognize that these two charts don't contradict each other. 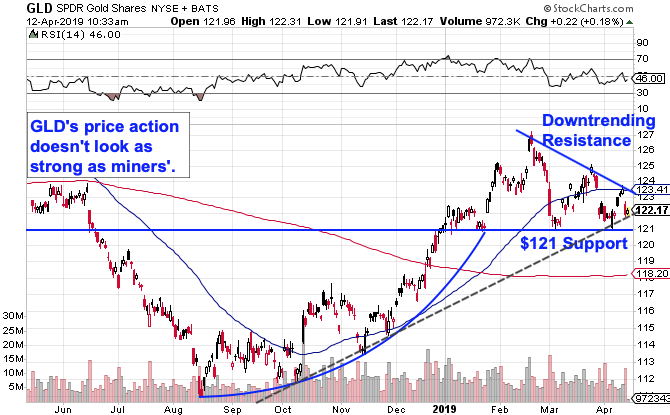 If GLD does fail to hold $121 support, a move lower is likely to coincide with a violation in the GDX uptrend (and a sell signal). At this point, it makes sense to remain cautiously optimistic about gold prices in 2019. Risk-management remains key, however, and the current charts also provide a clear level to pull the plug on the gold trade. As long as the bullish technical picture that's been in play all year long remains intact, it's a buy-the-dips market.